Gatlinburg's Tudor Inn: Splendid Customer Service! Gatlinburg is the gateway to Great Smoky Mountains National Park, Pigeon Forge, and Dollywood. Hiking, whitewater rafting, horseback riding, fishing, tubing, and geocaching are just some of the activities available in the national park. Visitors driving U.S. Route 441 across the park to Cherokee, North Carolina, are treated to hazy, misty blue vistas across the mountains, rain-fresh waterfalls, rushing rivers, and a deep, multifaceted, inviting forest. The town has many mountain-themed specialty shops and restaurants to suit every taste and budget. Main Street (U.S. 441) is a hub of activity, yet a six-minute walk takes guests to the quiet retreat that is the Tudor Inn, which overlooks the valley. Sufficient parking reduces the need to drive and pay for parking on Main Street. The Tudor theme is evident everywhere. Suits of armor decorate the foyer and lounge area and rich walnut paneling covers the walls. The period chairs are upholstered in a classic cherry red and the mahogany leather couch rests on a ruby red area rug. Guests are invited to linger and enjoy the gentle classical music playing in the background. The sunroom is a light-filled haven with two walls of windows and French doors. During the warmer months gentle breezes rustle the leaves on the trees and whisper into the sunroom. Brutus the squirrel and his colleagues provide entertainment during breakfast as they squabble over a feeder hung high enough that the bears cannot reach it. Tea, coffee, soft drinks, and snacks including an excellent selection of hot teas are available around the clock. A guest refrigerator, wine glasses, and a corkscrew are available in this relaxing space. Comfortable chairs for reading or relaxing and stylish round cafe tables encourage guests to linger. The look may be old but all the comforts modern travelers expect are available: free Wi-Fi throughout the property, high-definition TVs in every room, spacious, clean bathrooms with plenty of hot water, and superbly comfortable beds that almost demand guests sleep in. However, don’t sleep too long or you will miss the freshly prepared breakfast that is served every morning. Fresh fruit, homemade muffins, parfaits or smoothies, plus delicate quiches or eggs with sausage, ham, or bacon are served each morning. Any dietary restrictions that are shared in advance can be easily catered to. The Tudor Inn is quiet; its aura is one of peace and relaxation. Prior to its opening in 2013 the inn had served as a B&B and later as a weekly hotel. Bought from the bank in 2012, its transformation took the owners several months of cleaning and renovation to create the feel of a 15th century English country mansion. Outstanding customer service starts when you call to make your reservation. You will be asked for the first names of everyone in your party, which are used throughout your stay. This is a small B&B with just five rooms. Personal tours are given upon arrival so be sure to let them know when you plan to arrive. 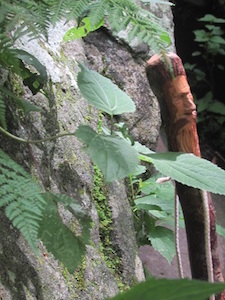 Take advantage of the loaner, hand-carved hiking sticks and umbrellas if it happens to be wet out — this is a mountain town, after all! A selection of local menus is available, each one carefully selected for the quality of food, service, and value. The inn is perfect for a couple’s weekend but will also accommodate families with children. Need a romantic place for an intimate wedding and honeymoon? Susan can marry you; family and friends can stay at the inn, reducing the need to coordinate multiple locations and services. Room rates start at $135 per night which is comparable to the chain hotels in the area. 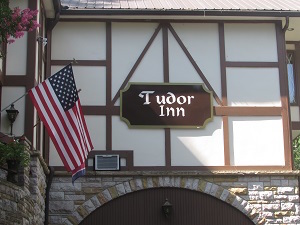 The Tudor Inn is located at 135 W. Holly Ridge Road, Gatlinburg, TN 37738. Call (865) 325-1173 and talk directly to Susan to set up your visit. Email: info@tudortn.com. Website: tudortn.com.